Precision made in the UK, this new product retains the exceptional quality and iconic design of the regular Icon Interdental Brush, but with added antibacterial protection. This high quality hygienic brush fights bacteria on a cellular level, killing bacteria and inhibiting its growth by the addition of new antibacterial technology in the manufacturing process. Completely invisible, tasteless and odourless it silently protects the user against harmful bacteria that could be present on the brush. 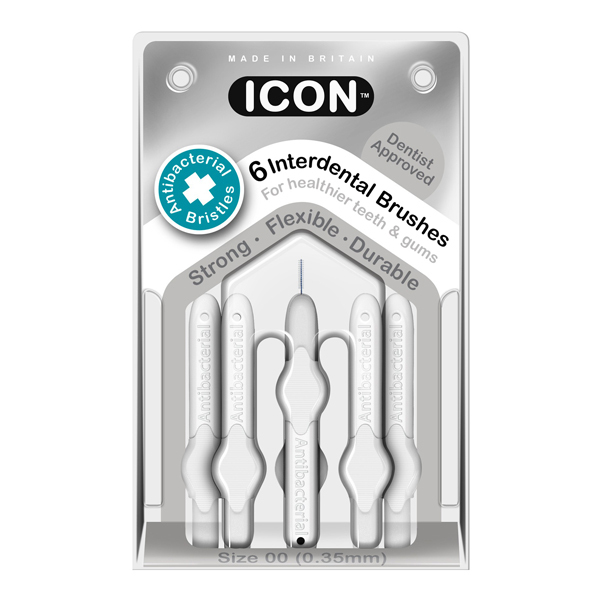 Every brush comes complete with an antibacterial cap; the ingredients are added during manufacture of both the nylon filament and the moulding of the protective cap to produce a hygienic 'safe zone' around the brush head. Safe technology with lasting protection, the brush is ISO compliant and the additives are FDA approved. Latest advances in science and technology enables the use of a new revolutionary, purely natural technology in this product which is completely harmless and safe for everyday use. The antibacterial protection lasts for as long as the product which delivers effective protection killing 99.99% of bacteria. Due to the quality of the additive and its manufacturing application it does not leach out or wash off, therefore preventing any loss of effectiveness. The antibacterial defence starts at manufacture but continues on to and after use ensuring continuous protection throughout.